Awesome Opportunity for Volunteers and Club Officers! 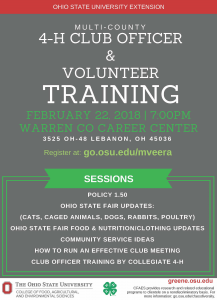 Mark your calendars for a multi-county volunteer and 4-H club officer training on February 22. Kirk Bloir and Lucinda Miller from the state office will present at volunteer break out sessions and Collegiate 4-H will conduct officer training for youth. Don’t miss this exciting opportunity for youth and adult volunteers! It is free but we need you to register at go.osu.edu/mveera. 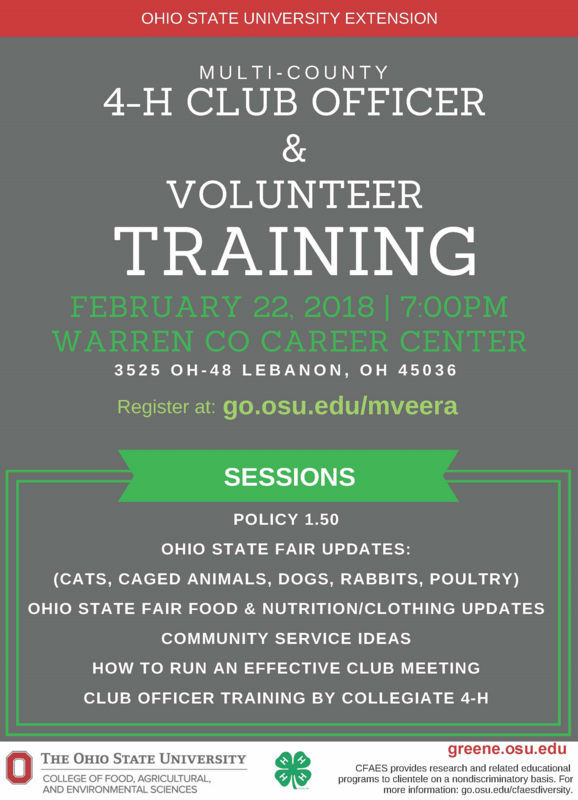 Be sure to mark your calendars for a Multi-County 4-H Club Officer and Volunteer Training! Click here for more information. It will take place on Thursday, February 22 at 7:00. There will be a variety of breakout sessions for both volunteers and for club officers. Check out the flyer for all of the information! Hope to see you there.